Vancity’s enterprise-wide digital signage solution Vancouver City Savings Credit Union (Vancity) serves nearly 500,000 members across British Columbia. To promote its community-driven vision, the financial co-operative had traditionally relied on a bulletin board and paper-based approach to merchandising within its branch locations. In 2011, however, the credit union made the decision to take a more modern and environmentally friendly approach, while at the same time conveying its message in an efficient, eye-catching, and forward-thinking manner. 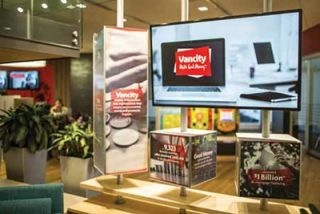 The objective of the digital signage was to not only modernize Vancity’s merchandising approach but to localize the content to reflect Vancity’s community focus. To accomplish this goal, Vancity created an enterprise-wide digital signage network powered by X2O Media’s Xpresenter platform that encompasses all 57 of its branches in Greater Vancouver, Victoria, and Squamish. Each Vancity branch is equipped with three 46-inch displays in a video wall configuration, with some of the larger locations featuring two video walls. Installed at the teller windows to provide visitors with a clear view while standing in line, the video walls offer financial tips and information on the local community and Vancity’s activities in it. The three screens can be controlled individually or as one single screen. This allows Vancity to display three unique pieces of content at one time, or a single wide-resolution video spanning all screens. The digital signage network’s content is managed by Vancity’s digital marketing team, which also oversees the credit union’s website and intranet to provide cohesive messaging across all platforms. In the design phase, the prospect of managing content over 57 locations in three cities was a primary concern, and was a central factor when it came to selecting a digital signage platform to drive Vancity’s network. To meet its needs, the credit union chose X2O Media’s platform, a complete suite of applications that allows users to create dynamic content for their digital displays quickly and easily, distribute the content, and then monitor activity on the displays using powerful browser-based management tools. Vancity’s digital signage network powered by X2O Media’s Xpresenter encompasses all 57 of its branches in Greater Vancouver, Victoria, and Squamish. X2O is also instrumental in addressing another primary concern for Vancity: customizing each video wall by location. While most of the content displayed consists of video, still images and text are also incorporated, and it is important that they resonate with the specific community they are located in. For example, it wouldn’t be appropriate to use images of mountains in communities that don’t have them. And information on events in one community would not apply to any others. The challenge is in bringing this level of customization quickly and efficiently to 57 different locations. The solution features X2O’s smart template approach, where the same templates are used in all locations, with simple changes to the text and still image portions made at the local branch level. X2O devised a simple, yet effective, workflow for Vancity where local branches upload their text in an Excel file, which is approved by the digital marketing team and easily added to the template. When the content plays out at each branch, it plays out the content from both the headquarters and the local team. For Vancity, this keeps content production expenses to a minimum while ensuring each branch’s messages are relevant to customers.